Technically SharePoint can store millions of records for documents, tasks, contacts, invoices, forms, wikis, pictures, calendars, issues, discussions, links, reports, libraries, and other list information. However, the potential is limited by List View Threshold limit that restricts the maximum number of items a list can display in a view. This view cannot be displayed because it exceeds the list view threshold (5000 items) enforced by the administrator. The restriction is applied even when filter is used to reduce the number of items in the list view to less than threshold, as the total number of items returned must be within the threshold before SharePoint processes the results through filters. List View Threshold (LVT) feature was created is to protect the server from unintentional load that may either bring it down, or at least cause other users higher latency or failures. Thus, changing the limit is not recommended. However, with the increasingly powerful servers, and the fact that administrators have the list view threshold of 20,000, instead of 5,000 for normal users, the List View Threshold limit may be able to increase without degrading the user experience. 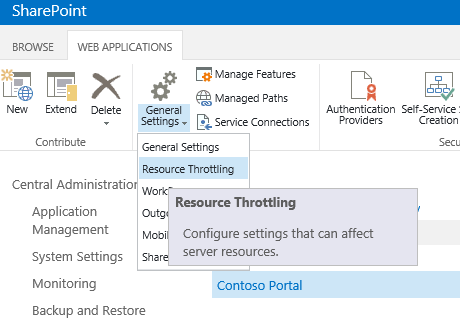 If your company is running on-premise SharePoint Server, the administrators can change the List View Threshold – increase or decrease – as shown in the tutorial below. Office 365 and SharePoint Online do not offer Central Administration module, hence the List View Threshold couldn’t be modified. Run Central Administration from Start Menu of the SharePoint Server. Go to Application Management -> Manage Web Application. In the Ribbon, click on General Settings and choose Resource Throttling from the drop-down menu. In the text box of List View Threshold, enter the new maximum number of items that you want to set as threshold. What if I don't have access to Central Administration of SharePoint? If you’re not administrator, or you’re using SharePoint Online or hosted on Office 365, or your administrator disinclined to change the List View Threshold, what’s your workaround? The workaround is to use indexed columns by applying indexes to fields and columns that you want to use to filter or sort the list. This is because SharePoint does not allow filtering on fields that have not been indexed on a list that has more items than the threshold. The caveat is that you cannot add an index to a column once the list has exceed the threshold. So if you’ve exceed the LTV and cannot filter the list, the remedy is either to delete enough items so that the list items count would drop below the threshold for you to index the columns, or create a new list with proper indexed columns, and then migrate the content to the next list.